Product #2598 | SKU AT4060 | 0.0 (no ratings yet) Thanks for your rating! 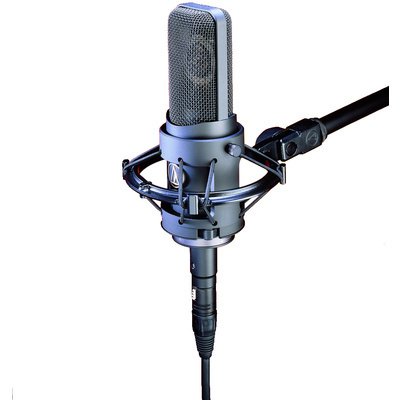 The AT4060 is a cardioid vacuum tube capacitor microphone designed for use in the most demanding studio applications. It utilizes dual, gold-plated and aged, large-diaphragm elements for extended frequency response. The AT4060 has a wide dynamic range of 131 dB and the ability to accept up to 150 dB SPL without capsule or electronic-system distortion above 1% T.H.D. These capabilities, coupled with the benefits of exceptionally low self-noise and very high output, combine in a versatile microphone that meets the diverse requirements of contemporary recording situations, while still providing the warm sound of vintage valve design. The AT4060 is the culmination of extensive field evaluations in studio environments with resultant significant advances in micro- phone performance factors. Each hand-selected tube is individually aged and tested, then employed in a uniquely-configured circuit for enhanced tube performance. Specially-tuned elements improve dynamic range and the ability to handle high SPLs without sacrific- ing high-frequency characteristics. Floating-construction mounting of the elements provides isolation from noise and vibration. The AT4060 incorporates a dual-diaphragm configuration that allows undistorted reproduction of high sound pressure level signals at all frequencies. The 2-micron-thick, vapor-deposited gold diaphragms provide accurate reproduction of even the most subtle sounds, especially high-frequency signals not easily reproduced by conventional large-diaphragm condenser transducers. For a warm, true-to-life quality, the dual, large-diaphragm design provides remarkable low-frequency performance. The diaphragm of every AT4060 is aged through five different steps to assure the optimum characteristics achieved will remain constant over years of use. The symmetrical housing assembly surrounding the microphone capsule and its open acoustical environment allow the off-axis response to be ideally suited for studio work where natural repro- duction of off-axis sound is of paramount importance. The AT4060 operates in conjunction with the included AT8560 power supply. The power supply has low-impedance output (3-pin XLRM-type connector) and a ground-lift switch. Mains voltage (120V or 230V AC) is selectable via a switch on the back of the unit. The AT4060 includes an AT8447 shock mount to provide mechanical isolation and secure mounting. This effective shock mount fits 5/8"-27 threaded stands. A stand clamp without shock mount, the AT8430, is available as an optional accessory. As with any sophisticated vacuum tube equipment, the AT4060 requires a period of warm-up time before use. Allow at least 15 minutes after switching on the power supply for the unit’s electronics to stabilize. Always turn the power supply off while connecting or discon- necting any cables.